Wondrously tunnelling into that hot eye. Imagine for a moment that you are a falcon soaring high above a flock of starlings in an endless bubble of blue that is your kingdom. You are a specialist in mid-air strikes and you are waiting for the perfect moment to fold your wings and plunge downwards. So incredible is the speed of your dive that at the moment of impact you may well be travelling at over 300 kilometers an hour. To survive the force of such a collision with your prey you are equipped with powerful legs and talons, but at such blinding velocity the slightest miscalculation could result in a high-speed impact that could cost you a broken wing. Below you an alarm has been sounded and the flock takes up a classic defence position. Now the starlings are flying in a tight formation, wingtip to wingtip and have created a hypnotic undulation of flying feathers that makes it impossible for you to target a single bird. So perfect is their defence that a dive would be suicidal. And so you wait, hovering like a Grim Reaper, waiting for natural selection to determine your next victim. Somewhere in the millions of years of intuition that has evolved in your brain you know that one of the starlings will inevitably have a flaw, a weakness in its wings perhaps, or a failure to sense the next turn of the flock, and for a few seconds it will be separate and vulnerable. Those few seconds suddenly appear. Like a thunderbolt you fall. This extraordinary tableau of life and split-second death is only one of the fascinating dramas that captured the imagination of a young David Allan before he began his convoluted journey towards ornithology. The Peregrine Falcon hunts by diving at over 360kph straight down and killing its prey on impact with a balled foot. It kills other birds with a literal falcon punch! David first fell in love with raptors when he took the plunge into a book by Peter Steyn called, “Eagle Days, A Study of African Eagles at the Nest” during his matric year. From that moment everything about birds captured his heart, aroused his curiosity and ignited his sense of wonder. But his fascination with these creatures went deeper. He was also spellbound by their mysteriousness, their seasonal disappearances and their freedom to go where he simply could not. He will be the first to tell you that our love affair with these creatures is captured by the mythical story of Icarus who flew too close to the sun so that the heat melted the wax that held his feathers together and he plunged to his death in the ocean below. The story may be remembered by some for its moralistic tale of youthful arrogance, but for David the beauty and wonder of flight was the ultimate reward. He understood, like all children intuitively do, that the desire to fly has its origins in the desire for freedom, a freedom unconstrained by the laws of gravity, or by the laws of man. Born and raised in the natural wonderland that was Kenya in the 1960s provided the ideal grounding with the Nairobi National Park and all its wonders as his “back-yard”. 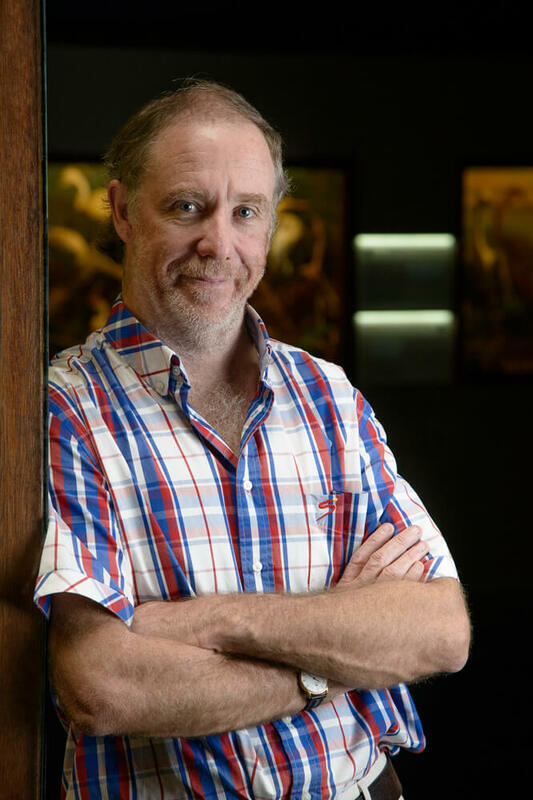 The passion for environmental issues was further nurtured after David’s family moved to Johannesburg when he was nine and a new environment was opened for exploration. A family visit to Hwange National Park in Zimbabwe provided a memorable highlight and he spent his free time exploring open spaces and working in the WESSA shop in Johannesburg. Whilst in matric he frequently cycled to Hartebeespoort in the Magaliesberg to visit the Skeerpoort vulture colony. It was at this stage that he met Warwick Tarboton the renowned ornithologist who was employed at the Transvaal Division of Nature Conservation. 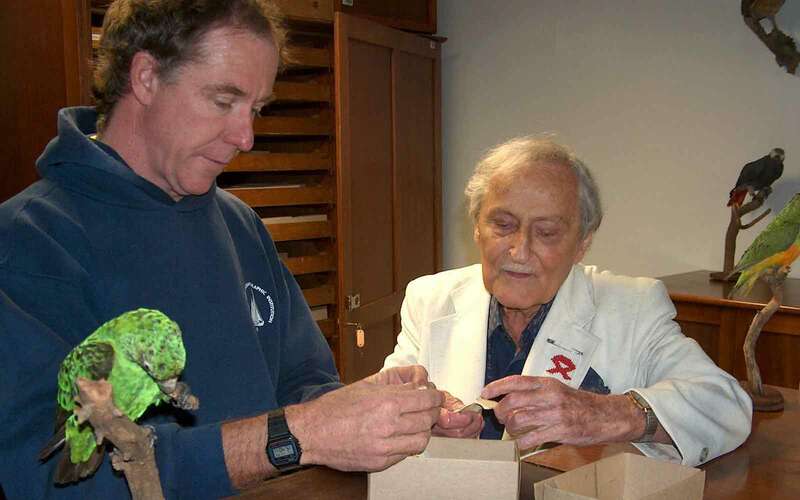 Warwick’s enthusiasm and extensive knowledge provided an inspiration for David and he was soon “hooked” on birds as the species of choice. 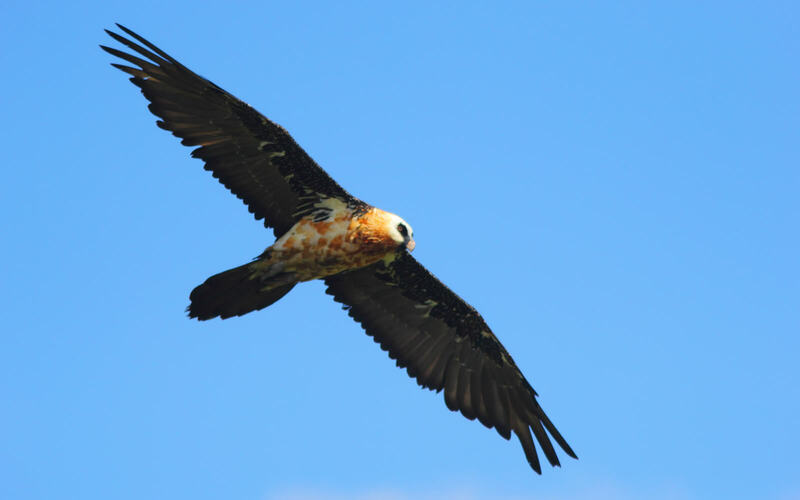 Bearded vultures wear makeup. They like to alter their appearance by rubbing their heads and necks in iron-rich soil to change their white feathers to a bright reddish-orange. The older and more socially dominant birds wear the most makeup to show off and appear more intimidating. 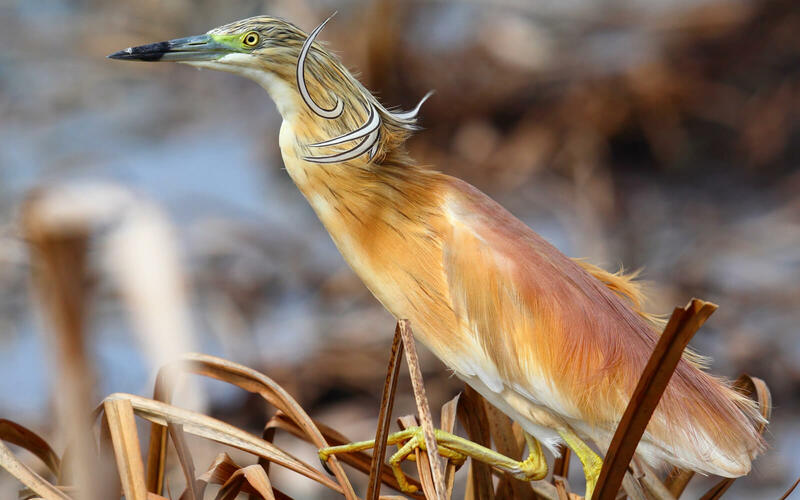 Despite his passion for birds and a desire for a career in one of many natural science fields, David considered such a career a high risk and encouraged by his parents he instead opted to study law. Not without some misgivings he completed his BA and started working in an attorney’s office handling divorces and debt collection. But even while studying a Legal BA at Wits and in subsequent employment he “moonlighted” to help Warwick do a study on raptors and specifically the accipiters. Hardly inspired by the drudgery of an office job David allowed the passion to overtake what may have been common sense and he abandoned the legal career and joined Warwick’s team as a Conservation Officer in the Transvaal Division of Nature Conservation. Under Warwick’s wing he started working initially on raptors, later on threatened grassland birds and latterly on the waterbirds of endoreic pans. It was during a presentation on accipiters that he met Prof. Hugh Patterson who recommended he do a BSc Honours in Zoology. This provided a new opportunity and a role as a Scientific Officer at the FitzPatrick Institute at the University of Cape Town where he completed an MSc which focused on the conservation status of cranes and bustards. In 1990 he transferred to the Avian Demography Unit at UCT and played a significant role in the First Southern African Bird Atlas Project. 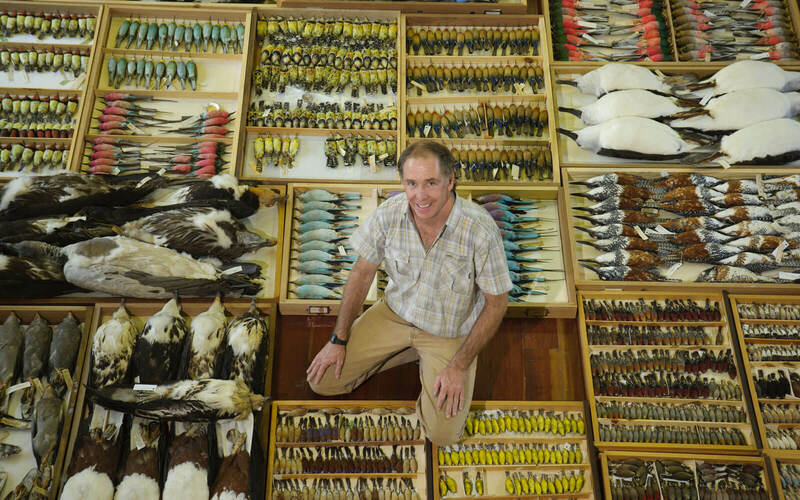 In 1996 he moved to his current position of Curator of Birds at the Durban Natural Science Museum (DNSM), a role he has filled with distinction and during which he has played a major role in research, promoting the avian fauna of the area and maintaining what is arguably the finest skins collection on the continent. The Curator’s role of the DNSM is varied and provides not only support to the scientific community but also to educationalists and interestingly to artists as well who wish to paint or draw birds for a multitude of reasons. Museums globally have been faced with numerous and varied challenges in recent decades foremost of which has been the need to remain relevant in an age where technology has been changing at a breath-taking speed. According to David the museums are no longer the driving engine for ornithology as all known birds have been identified and the pure research and taxonomical aspects have, by and large, moved to specialist institutions at Universities. In this expanding technological arena South African museums have somewhat ironically faced a massive challenge to be relevant within the context of a transforming South African society where large portions of the public have limited or no access to technology and limited transport. This has created unique local challenges which have had to take into account local conditions, traditions and beliefs as well as rapid urbanisation and large gaps in social equity which impact on access to what the DNSM can offer. It is in this context that the DNSM has excelled with its outreach programmes and Go-Wild! Mobile museum. 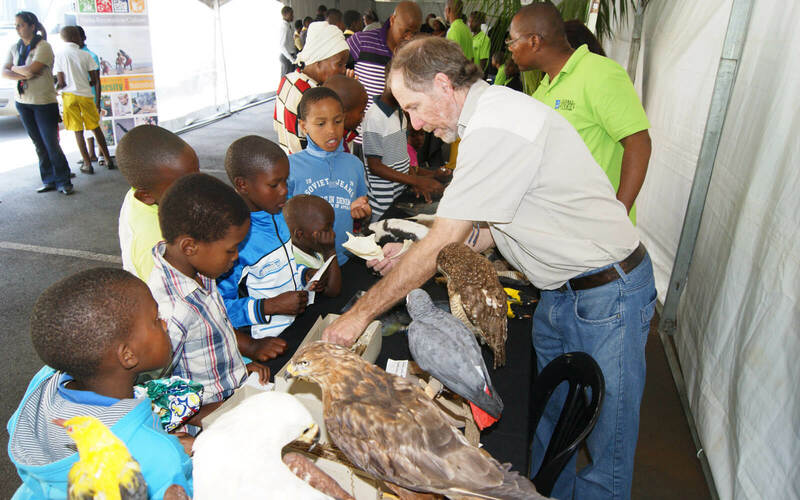 David has been an integral part of this outreach which has taken the museum “to the people” and this service has also been well utilised by Kloof Conservancy at various events. David at a Kloof Conservancy out-reach event at Kwa-Ximba. 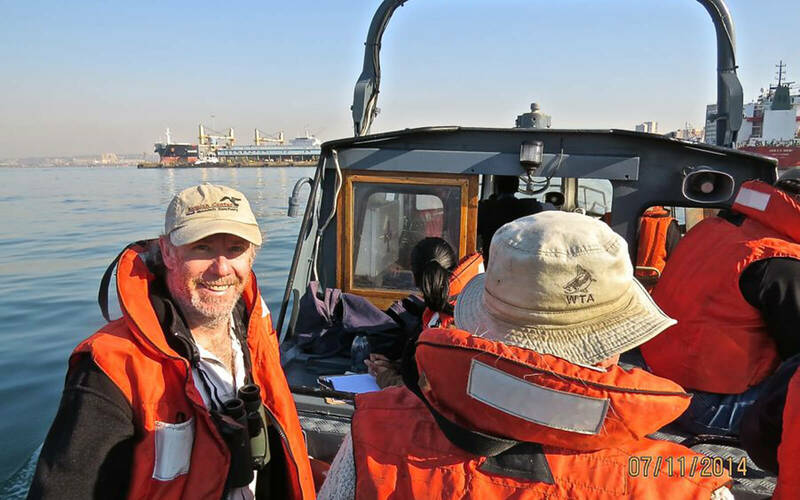 A group of birds that David has become particularly fond of since moving to Durban are the pelagic species and he has conducted over 92 tours at sea to study these fascinating birds. 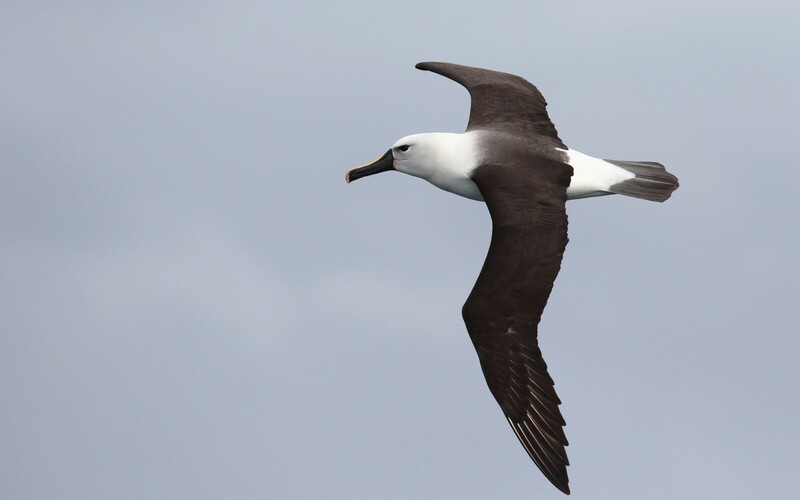 The albatrosses always provide a highlight of these trips simply because of their size and magnificent flying ability. The trips are always well attended by passionate bird lovers from all walks of life which makes for interesting conversations. Often the “birding” ship will follow the fishing trawlers as the birds have become exceptionally adept at picking the scraps from the trawlers and this also makes sightings easier but David has also become adept at creating some powerful “chum” of his own which is used to attract the birds within good photographing range. The Great Frigatebird sleeps in 12 second bursts while in flight, allowing them to fly non-stop for months at a time. Q. Tell us about one of the more interesting places you have visited as part of your work. A. Ethiopia! It has a huge number of endemic species and the people are amazing – it is an insult to leave an empty beer glass on the table as the hosts perceive that if the glass is empty then you have not had enough and they insist on bringing you another beer everytime you empty the glass. You are expected, rather counter-intuitively, to leave a completely-full glass as an indication that you have had enough – that took some rather hard lessons until I understood the custom! Until 1822 people didn’t know birds migrated for the winter. Some thought they went into hibernation under water, or flew to the moon. Q. Tell us about one of the more dangerous place you have visited. 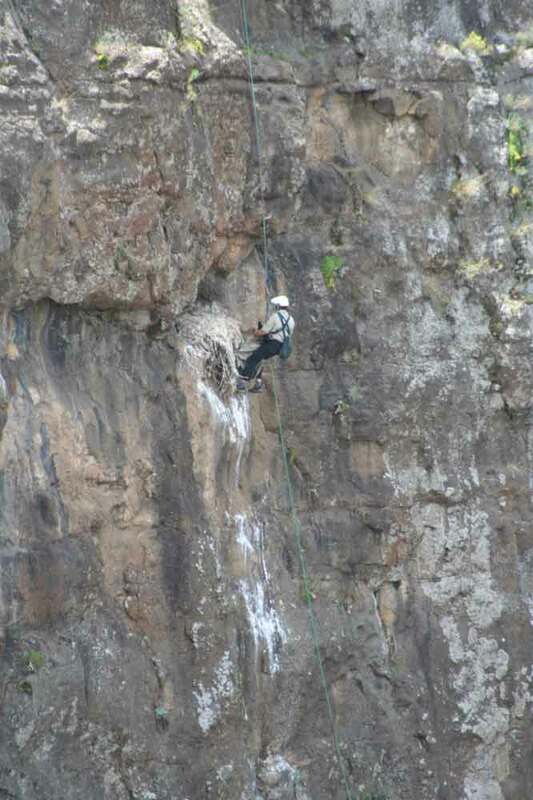 A. Abseiling to raptor nests always gets the adrenalin going – it’s a very lonely place once you are “on the rope”! Q. Tell us about one of your more frightening experiences in the field. A. Many years ago I visited the Richtersveld with a colleague Wally Petersen. Although we were studying bustards on the plains we also decided to hike up one of the local peaks called “Mount Doom” in search of Bradfield’s Swifts. Somehow we got separated on the descent as Wally’s primary interests were herpetology and botany and he soon lagged behind me. I got back to our vehicle OK but by sunset there was no sign of Wally. The Richtersveld is a very lonely and unforgiving place and I panicked and headed to Sendeligsdrift in the dark to enquire about getting a search party together the next morning. I returned to the area by midnight and set up a gas light in the hope that it would help Wally find his way back. At first light Wally eventually turned up, badly dehydrated and having eaten some of the rather rare local plants to get some moisture. Q. Tell us about one of your more exciting bird experiences. A. Spotting the Slender-billed Gull in Durban in 1999 – it was the only southern African record ever for this species. People get very excited when a new species is spotted and people arrived in droves to see this! Q. What has been one of your “oddest” birding experiences? A. Not quite a bird experience but at one stage I was doing research on the endangered Blue Swallow (most probably the most endangered bird species in SA and the next likely to be locally extinct!). Blue Swallows usually nest in the sloping walls of subterranean sinkholes, disused mineshafts or even Aardvark burrows. In the Mpumalanga area I would usually look for tree ferns as an indicator for sunken watercourses and on one occasion I heard a cow calling from near a tree fern only to find that a cow had fallen into a large hole formed by the underground watercourse and could not find its way out. Hours later and with the use of a tractor the grateful farmer recovered his cow but sadly there were no signs of the Blue Swallows in that hole. Q. What has been one of your most disappointing birding experiences? A. A very recent experience was particularly heart-rending. Late last summer a pair of Yellow-billed Kites took up residence in my Pinetown garden and built a nest in a tall tree. Both birds arrived back from migration apparently on the same day this spring and immediately began refurbishing their nest. We were really looking forward to following their nesting attempt through the summer. But it was only a few days later when I found the female lying freshly dead in one of our flowerbeds in the early morning. The cause of death could well have been poisoning but, of course, there is no way of being sure. We certainly do not use any poisons in the garden that could have been responsible but the kites, of course, wander over a much wider area. The male stuck around for a few days calling regularly but then deserted the garden and we’ve not seen him since. David’s role at the DNSM has not been limited to his direct work as Curator of Birds but over many years he has given countless talks (always with an exceptional sense of humour which he inherited from his father!) and has been a prolific author of scientific papers and popular articles and books on birds including 29 bird species accounts for Roberts Birds of Southern Africa. Whilst he has a soft spot for raptors he enjoyed most the compilation of the series on rare birds of Kwa-Zulu Natal. His future plans as an author include ongoing work with the DNSM’s scientific journal, Novitates, contributing text for a photographic book on cranes and hopefully compiling a book on the birds of Lesotho. Lesotho has always been an area which has had a special interest for David because the very unique habitat has resulted in a wide range of highly specialised birds and his research over many years has arguably made him the foremost authority on these birds. This long term study has highlighted some serious concerns regarding the management of the harbour area and in particular the reduction in the habitat for waterbirds with consequent reduction in bird numbers. David’s view is that development is inevitable but that it needs to be managed with a view to also protecting the environment. The balance between the need for development and protection of the environment is a major challenge for the municipality and is the source of much conflicting information. Within this context David believes that he has an important role to play by providing credible data on which informed decisions can be made. 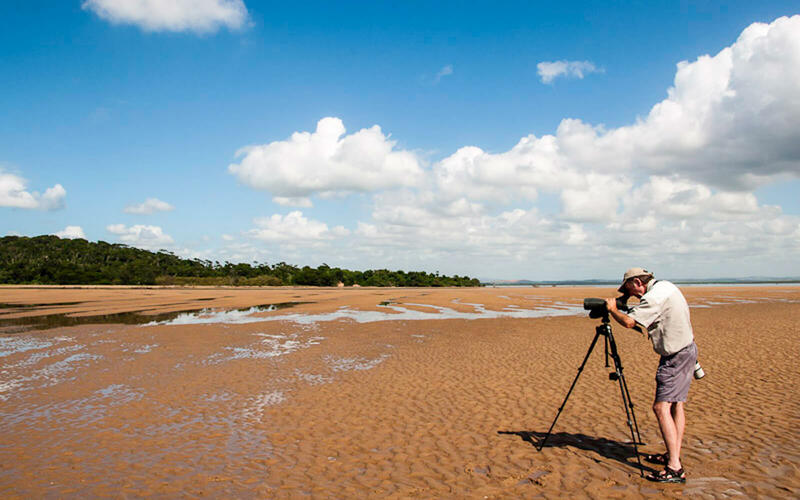 David’s contribution to waterbird statistics is not limited to the Durban harbour and he has conducted counts at numerous sites including Richards Bay and most recently in the renowned Elephant Marsh in Malawi. “When you lose birds you are most probably also losing other species so it’s a strong indicator that something is wrong”. This concern was further amplified because when asked about his general view of the future of our planet and specifically the environment David was more pessimistic than optimistic. The major concerns he expressed are that humans have been well warned of the potential calamity resulting from the planet’s 6th mass extinction** which is currently in progress. Despite all the warnings humans continue to plunge forward without any significant modification to consumption behaviour. Somewhat ironically he commented that the poor people of the world appear to be getting poorer and are not benefiting from the unfettered consumption of the earth’s resources! Maybe an early sign of attitudes and things to come was a simple incident that David recalled from his early days as a researcher. A large part of his work as a Conservation Officer for the Transvaal Division of Nature Conservation involved field work mainly on farms in outlying and remote areas. In those early days it was easy to drive up to a farm house and ask the farmer for permission to camp on their land and to survey the area for the relevant species he was studying at the time. Most farmers spoke Afrikaans which put David at a significant disadvantage as he was anything but fluent in the language but this also provided for an opportunity to engage something which farmers generally were very happy to do! Whilst researching declining vulture numbers he recalls a farmer telling him how plentiful vultures used to be and how they would gorge themselves on carcasses of dead cattle to the point where they could not fly. The farmer then described with great gusto how easily he could ride his horse into the flock of vultures and club them to death with a knobkerrie in a sort of spontaneous blood sport. The farmer then got a wistful expression on his face and wondered why all the vultures had disappeared from his district, with the irony of that question totally eluding him! Vultures urinate on their legs and feet to help cool off and to kill bacteria they’ve picked up from walking through carcasses. Over the years David’s work has been recognised by his peers and organisations across international boundaries and he has received numerous awards and the one he is proudest of has been the recognition by the EWT’s Bird of Prey Programme who recognised David for his contribution over many years to the conservation of raptors in southern Africa. The following extract from the citation for the award made by Prof Ara Monadjem and Dr Andrew Jenkins says it all! “The scope of David’s contribution to South African raptor biology and conservation is immense, and reflects his absolute dedication to the cause. A trademark of his work has been his ability to shift focus, easily switching from one area to another, or between taxa or issues, in order to bring his unique combination of consummate field skills, dogged tenacity and almost pedantic thoroughness to bear where it is most needed and effective. His preparedness to pitch in where required has meant that he has collaborated with many of us in the raptor research community over the years, and he has proved incredibly selfless in giving 100% effort in the field, or in providing his own hard-won data, to the benefit of other peoples’ projects. He has also ably mentored many young, aspiring birders and raptor fanatics in his time, and some of the now rather older members of our community owe him a sincere debt of thanks for the role he has played in developing their careers. 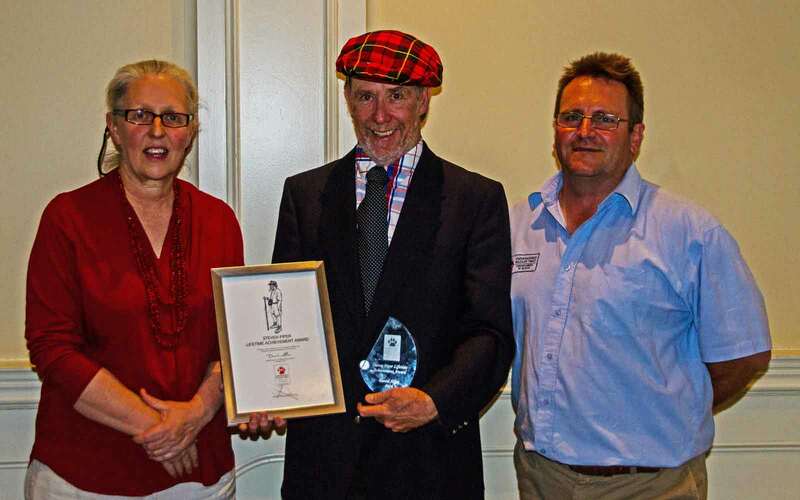 David Allan (centre) receiving the Endangered Wildlife Trust’s, Steven Piper Lifetime Achievement Award from Zephné Bernitz (Advisory Committee, Bird of Prey Programme) and André Botha (Manager, Birds of Prey Programme, Endangered Wildlife Trust) during an event at the Johannesburg Country Club on 7 October 2014. To appreciate David’s world, wake before dawn and close your eyes to the first melodic bird calls. Stare across the ocean and be impressed by the implacable flight of the albatross. Look above and marvel as the peregrine falcon closes its wings and readies to deliver it’s lethal “falcon punch”. The natural world is both beautiful and bloody. But don’t forget to imagine Icarus soaring above you as well, weightless and wonderful. And you will also understand Dave Allan’s obsession with birds and with contributing more invaluable knowledge to a world we would so dearly love to emulate for he is a true member of the Eco-impi! A group of larks is called an exaltation, a group of chickens is called a peep, a group of geese is called a gaggle, a group of ravens is called a murder, and a group of owls is called a parliament. *The waterbirds of Durban Bay – Current and historical population trends. 2012. Durban Natural Science Museum Novitates 35; 1-74.